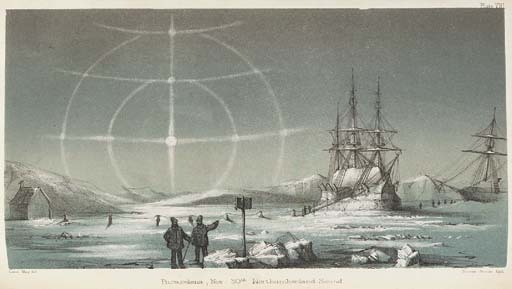 The Last of the Arctic Voyages; being a narrative of the expedition in H.M.S.Assistance... in search of Sir John Franklin, during the years 1852-53-54. London: Lovell Reeve, 1855. 2 volumes in one, 8° (243 x 147mm). Half-titles. 4 maps, 3 engraved and folding, one lithographic, 36 lithographic plates, 12 coloured. (Some light soiling, small tears to folding maps.) Near-contemporary brown half morocco, spine gilt, gilt edges (scuffing to extremities). First edition. Abbey Travel II,645; Sabin 4389.